So, I’m from West Virginia. It’s a safe state, a gorgeous state, a quiet and antiquated kind of state, the state where my family lives … but for various reasons, I’ve never had an overabundance of state pride. That is, with the firm exception of every time that John Denver’s “Country Roads” comes on the radio. That song, for whatever reason, just makes me swell with gladness. 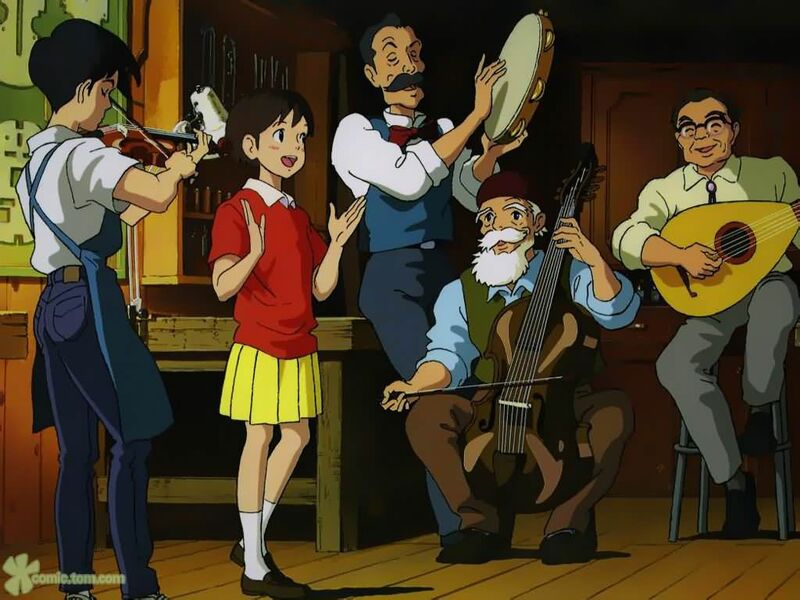 So when I first watched Whisper of the Heart and heard Olivia Newton John singing that song over the opening credits, I was all at once filled with the aforementioned gladness, along with the rapturous hilarity of that song’s being essentially the theme song to a thoroughly Japanese animated film. I knew that this film would either be an incredible viewing experience or an utter disaster. And, for me, it did not disappoint — not the first time, nor this time. I could go on, but you see, unless you happened to be just like me, as I was in eighth grade, you’d probably get bored with lists of things that only seem significant to me. Similarly, if none of this post whatsoever has made any sense to you (I wouldn’t blame you — it’s all over the place this week! ), you might find yourself also disliking Whisper of the Heart. So, I’m going to move on to the hard facts, the relatable parts, and you can decide if it’s worth a viewing. First off, it’s written by Hayao Miyazaki, so that’s an automatic point in its favor … but, he didn’t direct the film, so it does stray from typical Miyazaki fare somewhat in tone and quality. The music is not Hisaishi, so that’s a strike … but, it is quite delightful nonetheless. In particular, the impromptu folk jam session (picture above) is wonderfully joyous. There aren’t many recognizable big-ticket names on the list of English voice actors, with the exception of the perfectly-cast Cary Elwes as the Baron. So, Pros: Lovely music, if you’re okay with hearing “Country Roads” about a hundred times … which I am. Decent if not recognizable voice acting. Beautiful Ghibli-quality animation. A fun and adventurous and deeply relatable story, for some. Did I mention the impropmtu folk jam session? Yeah, cause moments like that should happen in real life. Cats. Enough said. Cons: If you’re not me, you might not like this film. Preeeeeettttty cheesy and over-sentimentalized and juvenile. Eighth-grade love story (Ghilbli has an awkward habit of making films about little kids falling in love). Could be considered slow and shallow by some.